Are you looking for somewhere special to spend some time with family or friends? 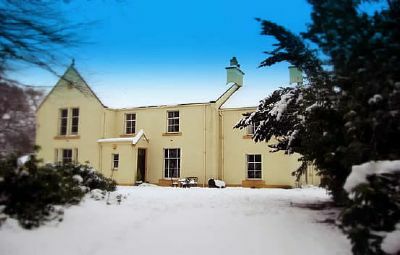 Then perhaps you could consider renting our wonderful, large, listed home and read in your own library or relax in front of a roaring fire or make cocktails in the outdoor bar! Relax at midnight or later in your hot tub under the stars or swim in the heated pool.Sweat out those toxins in the sauna before or after a walk along the antonine wall. We have unique outdoor entertainment facilities completely private and featuring heated swimming pool, hot tub, sauna and BBQ hut.Let the children romp in the fully equipped playroom while you read a book by the real fire or enjoy cooking a meal in the well equipped and newly renovated kitchen. Get the whole family together chatting in one of the 2 "quiet" lounges without television. Of course there is a separate room with a 42 inch television for those who do not like to miss their favourite programme. There is also a cinema, large bathroom with bath big enough for 2 to share overlooking fields with deers and cows and an ensuite with bath and its won TV. 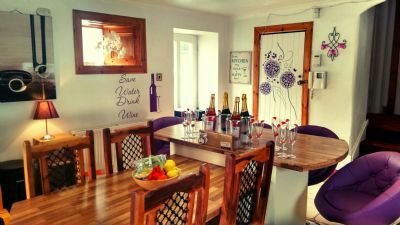 *The games room is available only when the cottages are booked with your booking or when the cottages are not occupied and there is an additional charge.